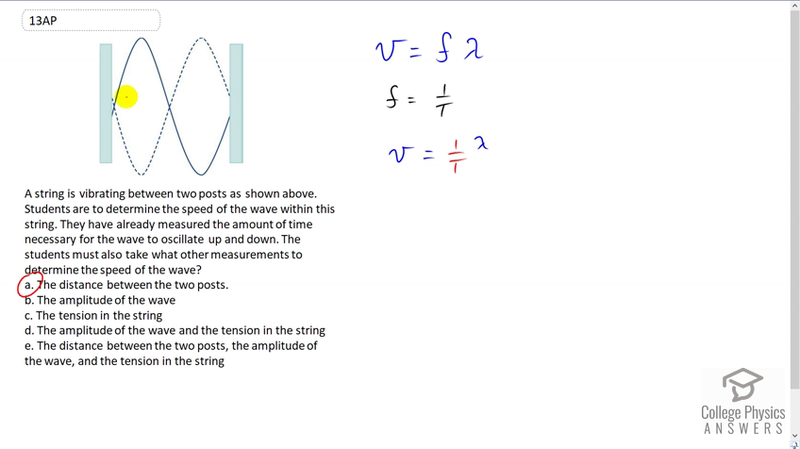 A string is vibrating between two posts as shown abovStudents are to determine the speed of the wave within this string. They have already measured the amount of time necessary for the wave to oscillate up and down. The students must also take what other measurements to determine the speed of the wave? The distance between the two posts. This is College Physics Answers with Shaun Dychko. The students have made a measurement of how long it takes for this wave to oscillate. That is on a string between two posts. And they want to find the speed of the wave. And so the next thing we need to measure is the distance between the posts because if they have the harmonic with just only one wavelength between the posts. And so the distance between the posts will equal the wavelength. So this is a full wavelength, lambda here. So wave speed is frequency multiplied by wavelength. And you can figure out frequency based on knowing the period which is the amount of time for it to oscillate up and down. Because frequency is a reciprocal of period, so we write one over T in place of frequency here. And this will get the wave speed. So we need to find the distance between the posts in order to know lambda. To substitute for lambda here in the wave speed formula and divide that by the period to get the speed. The answer is a.